It's nearing last call for the joyful, new Broadway show Escape to Margaritaville. 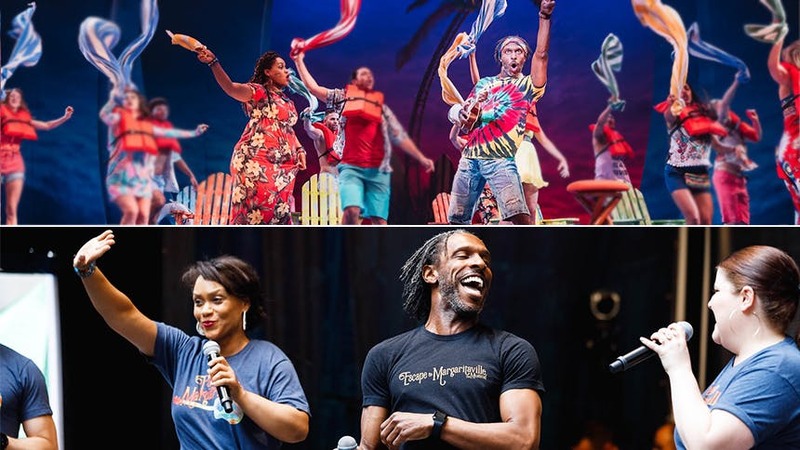 The Jimmy Buffett musical plays its final performance July 1 at the Marquis Theatre, but before all the booze in the blender is gone, BroadwayBox spotlights two of our favorite Margaritaville scene-stealers, Rema Webb & Andre Ward. The talented pair brings major laughs and major vocals as resort owner Marley and her right hand man Jamal. BroadwayBox caught up with the dynamic duo to hear from them about their experience with Escape to Margaritaville from out of town to Broadway, working with Jimmy Buffett, and finding their comedic chemistry. What moment on stage are you having the most fun? I’m having the most fun in the “Margaritaville”...last scene of 1st act. I have so many fun moments, but the end of Act 1 with Rema. Tell me a story: How do you think Jamal & Marley met? I think Marley is Jamal’s Aunt or Godmother. Marley and Jamal’s Mama are best friends. Marley and my mom are friends. She’s known Jamal forever. What do you attribute your wonderful comedic chemistry together to? Andre and I work comedically together on stage because we work comedically together off-stage. We get each other’s humor and quirks. And we truly enjoy each other’s company! We are always laughing and tripping off of each other, even if it’s in a corner somewhere. Sometimes people enter your life who you feel like you’ve known longer than you have. Rema was that person. I had an immediate trust and comfort with her. What’s your favorite memory out of town with Margaritaville? One of my favorite memories out of town was running into Rema at the shopping complex behind the apartments in La Jolla and shopping together. What’s been your biggest Margaritaville mishap? My biggest Margaritaville mishap was when I paged a curtain too early for Paul and he ran out too early, then circled back off-stage. I just couldn’t talk in the next scene. He and Charlie had to help me get through the scene, but then they couldn’t get through either. LOL. I’ve had a few mishaps onstage but one that stands out is falling center stage during my bow in La Jolla. It was only a second but it felt epic. What was your first meeting with Jimmy Buffett like? I remember briefly meeting Jimmy at the first day of rehearsals in La Jolla. But what really stood out to me was a few days later, or maybe it was a week later, when he sang a new song that they were putting in the show. I couldn’t believe how gracious and down-to-earth he was...and that we were experiencing him create in the room! I met Jimmy Buffett after the first reading of the show and was nervous because I had to sing his songs in front of him. He couldn’t have been more down to earth and gracious. He said it was surreal to hear his songs sung to him and I felt much more comfortable and less nervous. What do you both laugh about most offstage? We laugh at so many things. I can hear Andre’s thoughts even when he’s quiet! We laugh most about the absurdity of everyday life. How has Margaritaville and this experience changed you? Margaritaville has changed me by exposing me to the genre that is Jimmy Buffett. I already have so much joy every time I get to step onto a stage and perform, and Margaritaville elevated that joy to another level! My experience has been one of the happiest moments of my life...from La Jolla until present. This show is special, fun healing...and I’m still hoping it becomes a legacy show that generations get to experience! It’s been a fantastic experience to bring people such joy. People return to the show 5and 6 times, and that puts a smile on my face and in my heart. Don't miss Rema Webb & Andre Ward in Escape to Margaritaville at Broadway's Marquis Theatre through July 1. Broadway Unplugged: Desperate Measures Star Lauren Molina Performs Her Stripper Showstopper "It's Getting Hot in Here"